The inspiration for this project was Paolo IZ1KXQ, who used a simple SA602-based homebrew direct conversion receiver to produce some very nice QRSS reception reports, of my Junkbox QRSS beacon and others. Paolo's receiver was based on a 1997 QST article by Daniel Wissell, N1YBT: "The 40m SLR - a Shielded-Loop Receiver". Paolo didn't use a shielded loop, he used a toroid as matching and input filter connected directly to a 30m dipole. I was surprised by the excellent results Paolo achieved and decided to have a go myself. As an additional twist I decided to try to power the receiver from the USB port of a laptop computer, which supplies 5V at up to a few hundred mA. My circuit (see above left) uses Paolo's input matching filter, followed by a simple SA602 as mixer and crystal oscillator. John VK6JY sent a nice computer-drawn diagram (above middle) and also a version with an LM386 audio amplifier for driving a small loudspeaker (above right). I grounded one side of the bandpass filter tuning capacitor, the side connected to the tuning capacitor shaft: this is so that when adjusted with a screwdriver the tuning is not affected by the connection to the screwdriver. The balanced output from the mixer is fed into a low noise NE5534 op-amp. The gain of the op-amp is set at 45dB. The output is fed directly to the line input of the laptop computer. Despite the NE5534 datasheet specifying a minimum supply voltage of +/- 3V, it seems to work fine at just 5V single rail. 10.140MHz crystals are available from Peter DL6NL, see his contact details at the bottom of my my Junkbox QRSS beacon page. The incoming +5V from the laptop is filtered by an arrangement of two L-C filter sections, each consisting of a 10uH inductor and 220uF / 0.22uF capacitor combination. In operation I tried swapping the USB power source for a 9V (PP9) battery but could not detect any difference in noise level. So I concluded that USB-supplied power is clean enough to power a receiver! I did notice a substantial increase in noise level when running the mains power supply to charge the laptop batteries. So: operate QRSS reception on battery power alone! As for construction: I purchased a tin of Ozon mints. You'll notice from the photographs, that it's a very small tin. The mints are also tiny and tasty (70 of them). You can eat them very fast but your mouth will sting for a while afterwards. I built the receiver "ugly" style on a small offcut of PCB, which I soldered into the tin when done. After application of the soldering iron for a few seconds, solder adheres very well to the tin. I drilled two small holes in the sides of the tin, and fed through 7-stranded wire as the two arms of the 30m dipole. Each is 7.1m long. The receiver therefore sits directly at the centre point of the dipole, i.e. there is no feeder between antenna and receiver. Power from the laptop, and audio back to the laptop, come and go via about 7m of twin screened cable (separately screened). I found that of the four wires in a USB cable, the 0 and +5V are conveniently and sensibly colour-coded black and red. 1. The tiny Ozon mint box, with the lid closed. 2. Open the lid, to see the tiny receiver! 3. The antenna wires (blue and green) and power/audio cable wind up into a compact and portable package. 4. Operating mobile in my garden. The receiver can be seen hanging in the middle of the dipole, against the blue sky background. The last of these pictures, shows the receiver enclosed in an additional box made from white polystyrene packaging material intercepted on its way to the rubbish bin. This was hastily cut up and formed into a polystyrene box to provide some degree of thermal insulation. Without this, the crystal drifted up and down by a few 10's of Hz quite rapidly, as the sun came and went behind clouds. With the polystyrene box this problem was greatly reduced, resulting in a slower drift over several minutes. With indoor operation this would be less of a problem. The receiver seems to work well. The audio can be monitored simply by plugging earphones into the computer's sound output socket. The design is fully differential and whilst some broadcast breakthrough is occasionally audible, it is very infrequent and barely noticeable. My first test of the receiver was to listen for my own 30m QRSS beacon signal (image above left). Reception of the 360mW signal from just a few metres away was of course no great feat of DX - but useful as it allowed me to easily tune the front-end bandpass filter for maximum signal strength, and test out the various settings of the ARGO spectrum analysis software. 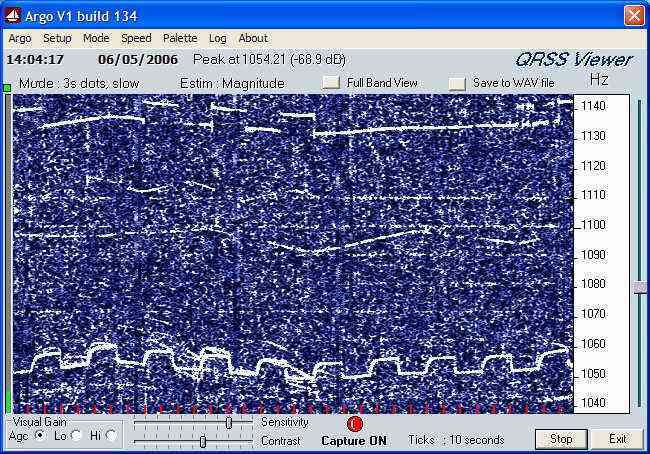 ARGO is the most popular of the available free software packages for decoding QRSS signals and can be downloaded here. Image second left above shows my first decoding of my own beacon signal. Notice the rapid frequency drift in the receiver causing the trace to look very wobbly. That was before I put the receiver board in its tin. The following day I installed the receiver in its tin and the rapid drift disappeared, see the trace in image (above second right). I switched off the transmitter and connected the receiver to the attic dipole - I was able to receive my first remote beacon station (above far right, that's the weak trace of Andrea IK4IDP in Bologna, Italy - locator JN54QL. On 3'rd May 2006 I switched off my beacon transmitter again for a few hours (since it is impossible to receive any remote signals whilst a local signal is booming in at point blank range). I hung the dipole antenna between a tree in the front garden and an upstairs window, at about 4 - 5m height from the ground. I was able to copy three stations as shown below. Note that the drift is all in the receiver, rather than the transmit stations. Andrea IK4IDP sends a nice and easily identifiable triangular modulation from Bologna, Italy, JN54QL. Received at 13:46 UT. Andrea IW0HK in Rome, Italy, JN61FV, with a strange test modulation system! Received at 15:53 UT. Christian DL6JAN in Chemnitz, Germany, JO60KU sent FSKCW with a shift of a few Hz. Received at 16:32 UT. G0UPL/IW0HK QRSS mini-DXpedition in London! On 5'th May Andrea IW0HK visited London on holiday with his XYL and two young sons. We met at 1pm (12:00UT) at Tufnell Park tube station and walked to Hampstead Heath. I have never been there before. Not far into the park is a nice hill named "Parliament Hill". WX condx were perfect. We climbed the hill and found some trees near the top on the South side, with an excellent view southwards over the whole of London. I climbed the low branches of two perfectly spaced trees and tied the two ends of the dipole at about 4m above ground. The receiver at the dipole's centre hung at about 2m above ground. My favourite image (see right) shows all four stations, in that order from top to bottom (i.e. IZ1KXQ, WB3ANQ, IK4IDP, G0UPL). Larry is the triangular waveform at around 1110. Note that the frequency scale is not calibrated and the computer's date is wrong by one day. The drift is evident in the receiver crystal frequency, due to the sunshine and wind competing to heat and cool the receiver tin! Some pictures of the DXpedition: CLICK for larger versions! 09. From the top of parliament hill, a beautiful view to the South across the whole of London towards G0UPL's QTH 20km South. 10. We selected some trees slightly down from the top of the hill, on the Southern slope. 11. The receiver hangs about 2m above ground at the centre of the antenna, which slopes up to about 4m at the ends. 12. G0UPL studies the laptop screen. G0UPL (left) and Andrea IW0HK. Photographer anonymous, borrowed from the bench in the background. 14. DXpedition communications headquarters: Andrea's mobile phone and handheld VHF/UHF transceiver, laptop and Hans' Blackberry. 15. Laptop computer decodes QRSS (using ARGO software). 16. In these concluding moments, signals dissappear as G0UPL climbs trees and IW0HK rolls up the dipole wire. We noticed some interesting propagation effects on my beacon G0UPL, operational some 20km to the South. London lies in a low basin, and my home QTH is in the hills to the South. We therefore would have had almost a direct line of sight to my home QTH from Parliament Hill. The image to the left shows a rapidly converging ghost image above the main image - I wonder if this is an ionospheric doppler effect, or an aircraft reflection? Here's another image showing many ghost images alongside the main trace. The reason I wonder about aircraft is because the main approach (or departure, depending on wind direction) airway to London's busy Heathrow airport lies directly between us and the G0UPL transmitter. Here's another nice capture taken at 13:20UT, showing IZ1KXQ' FSK CW (top) and IK4IDP's triangle. Des M0AYF made some nice developments on this receiver, see here. Comments from Johan Breukink PA0TAB: Johan writes: "I made a rx like yours with the extra transistor in the oscilator (M0AYF). I got a problem with lf breaktrough. I found it is detection at the input of the lf amp. So I put a 1nF c over the inputs and it disappears. I changed also the divide for the -input of the lf amp in 2x 2k7 (was 2x 1k) The rx is online http://www.pa0tab.nl/grabber.html"
I wrote an article on this project for the July 2007 edition of Electronics Weekly's "Gadget Freak" feature. Their photographer even made me look pretty insane. 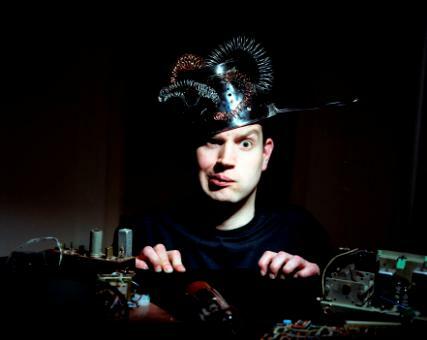 Click to read the article at http://www.electronicsweekly.com/blogs/gadget-freak/2007/07/hans-knows-the-truth-is-out-th.html. Don't miss the 30m Junkbox QRSS beacon page!